OneLogin Desktop 3.0 for Mac enables users to log in to their Mac OS X devices using their OneLogin credentials. A certificate is installed in their keychain that authenticates access to the OneLogin portal and SSO-enabled browser-based apps on a trusted device. In other words, users log in to their Macs once and are directed to the OneLogin portal, or their SSO-enabled apps, without providing credentials again. OneLogin Desktop enables you, as the admin, to manage Mac and Windows devices that use OneLogin Desktop for authentication, rather than maintaining Active Directory or an LDAP directory. Devices are managed with a Device Manager dashboard in OneLogin. In order to enable this authentication process, users run the installer on their local machines that automatically configures a user account with their OneLogin credentials and authenticates against the OneLogin directory. This OneLogin Desktop user account has local admin privileges. Admins can push OneLogin Desktop, Basic or Full, to multiple machines running macOS with the Silent Installer. Once installed, admins can view the machines that run OneLogin Desktop in the Device Dashboard. The installer also installs a certificate in the keychain of the new user account. If you allow users to bypass "browser SSO," giving them access to OneLogin after logging into their Macs without authenticating to the OneLogin portal, OneLogin Desktop uses that certificate to establish trust between OneLogin and the user account on that specific device. 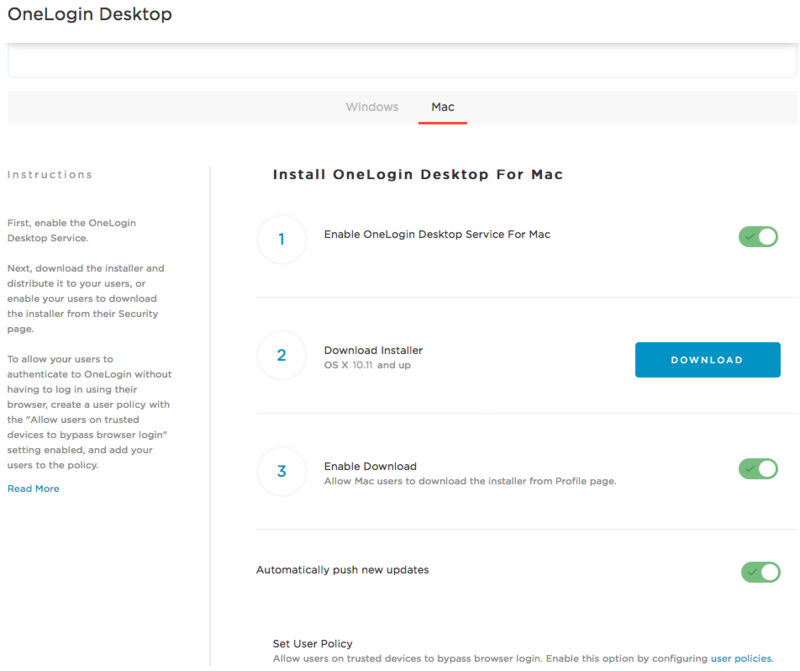 When users install OneLogin Desktop, they are prompted to select an installation type, Basic or Full. OneLogin Desktop Full is similar to the experience of previous versions of Desktop. Users log in with OneLogin credentials and gain instant access to the portal and OneLogin managed apps. Includes the Tray app, which allows users to generate a new certificate. OneLogin Desktop Basic allows multiple users to access OneLogin Portal and OneLogin managed apps, using the Tray app to log in and out. Essentially, one machine can act as a terminal for multiple users. Users aren't bound to one device. Users log in to a computer using their domain username and password. OneLogin Desktop Basic is beneficial if devices are part of a Windows network and users log in with Windows domain credentials. For more information about Basic OneLogin Desktop, see OneLogin Desktop Basic. For more information about Full OneLogin Desktop, OneLogin Desktop Full. Go to Devices > OneLogin Desktop and select the Mac tab. 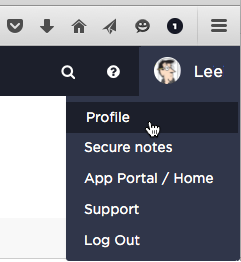 Toggle the Enable OneLogin Desktop Service For Mac button on. 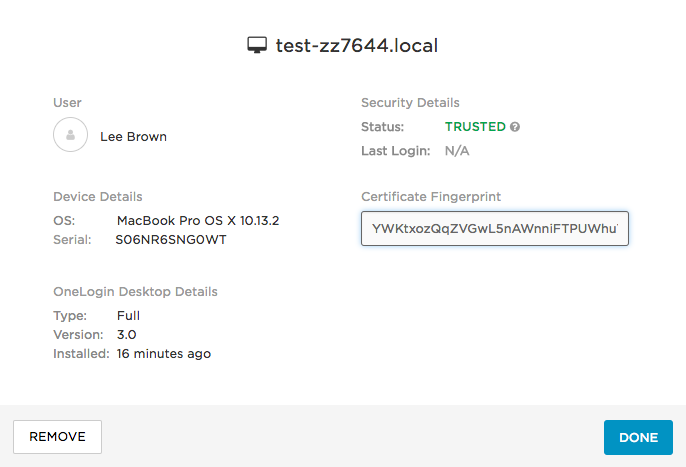 This enables your OneLogin Cloud Directory to authenticate Mac users against OneLogin. (Optional) Provide users the ability to go straight to their OneLogin portal or SSO-enabled apps without logging in. Click the user policies link or go to Users > Policies. Click New User Policy or select an existing user policy to update. Under Trusted Devices, select Don’t require browser login for trusted devices. Note: this option appears only if you have already enabled the OneLogin Desktop Service for Mac in step 3, above. Assign the policy to the appropriate users. For more information about creating and assigning user policies, see User Policies. Use the Devices dashboard to manage the Mac and Windows devices that use OneLogin Desktop 3.0 for authentication. Go to Devices > Devices. Use the dropdown menus to filter by device type (operating system) and status (Trusted, Registered, or Uninstalled) or search users or device names. A Trusted user/device is one that can use a certificate as the authentication factor in place of passwords and MFA when authenticating to OneLogin. A Trusted user account/device is one that allows the user to log in using their OneLogin credentials and go straight to their OneLogin portal or SSO-enabled, browser-based apps without authenticating again using the browser. By definition, a Trusted user account is one that is assigned to a User Policy enabled for Trusted devices. A Registered user/device is one that has had OneLogin Desktop installed but cannot use a certificate (if installed) in place of browser login using a password (and MFA if required). Registered users authenticate against OneLogin to access their user account on their device. 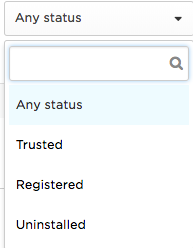 Click a user/device row to view details and remove Trusted status for a user. The Uninstalled filter lists devices where OneLogin desktop was uninstalled. Uninstalled devices are still considered Trusted. 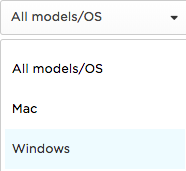 Use the All Models/OS filter to list devices by their OS. Remove revokes the certificate and makes the user untrusted for that device. The user is unable to skip browser authentication, but can log in to their OneLogin Desktop account on their Mac. Once you remove the device, it no longer appears in your dashboard. Note that to lock the user out of the OneLogin Desktop account on their Mac, you must also change the user's password or suspend or delete the user's account in OneLogin. You can view a user’s OneLogin Desktop-authenticated devices by going to the Devices tab on the user record (Users > All Users > select the user>Devices). The Silent Installer script allows admins to leverage command line input to install OneLogin Desktop 3.0 using the Terminal. Push the installer script file to multiple laptop devices through MDM platforms, such as Airwatch or JAMF, and silently execute the installer script to install OneLogin Desktop for Mac 3.0 on those laptop devices. Once installed, admins can view the machines that run Desktop in the Device Dashboard. Use the Silent Installer to push Basic or Full versions of OneLogin Desktop for Mac 3.0. Important! To download the Silent Installer script, click Silent Installer File. Note: You must run the installer from an admin account or the installation will fail. Once the admin installs and executes the Silent Installer script, the end-user must complete additional steps. For Basic and Full instances, users must access the Tray app to complete the set up process. For both Basic and Full install using Silent Installer, users click on the Tray app icon and select Log in to enter their OneLogin credentials. To run the silent installer script using a 3rd party MDM solution, such as Airwatch or JAMF, package the file and push it to the target systems. Once on the target systems, execute the silent installer script by using the platform-specific command. Reference Airwatch's documentation as a guideline, here. Note: The target system must be online in order for this to work. To download the Silent Installer script, click Silent Installer File. A Finder window opens, displaying the OneLogin app and the Uninstaller. Click the Uninstaller. A dialog appears confirming your successful uninstall of OneLogin Desktop. To remove the device from your Devices dashboard, log in to OneLogin as an admin, go to Devices > Devices, select the device, and click the Remove button on the device details dialog.